Please fill in the short form below with your question, either about the Simrad AP28 Autopilot, or for some technical advice. Please include details of your vessel if you feel they will help us answer your query. 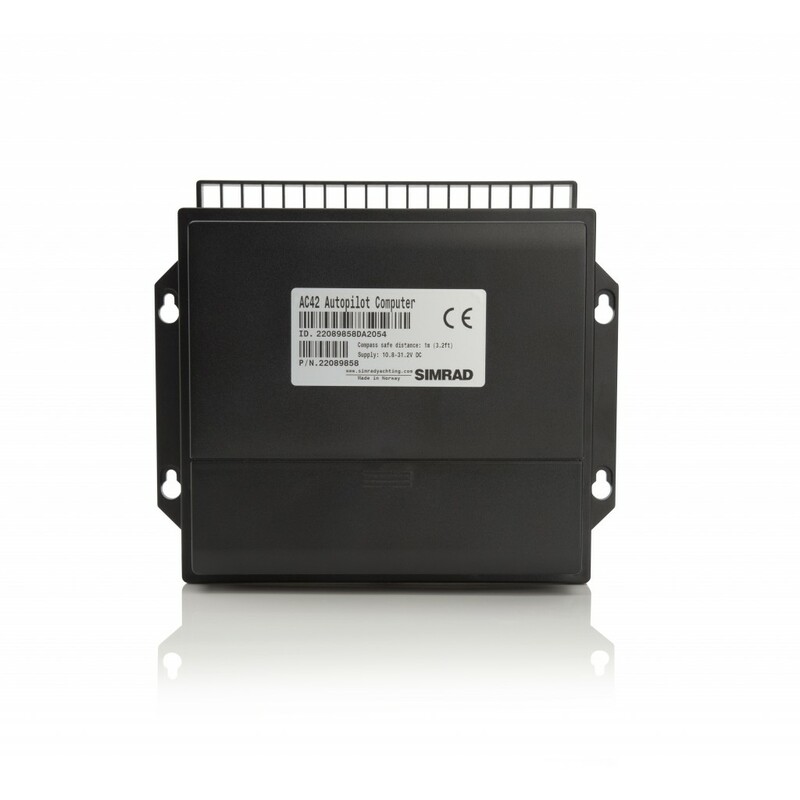 The AP28 features a large LCD display and operation is via a new interface. This simple display and control setup gives you access to a raft of features and performance options. The Simrad AP28 Autopilot is equipped with advanced control algorithms that enable smooth and precise turns regardless of sea conditions. This feature also improves tack and gybe performance on sailboats. 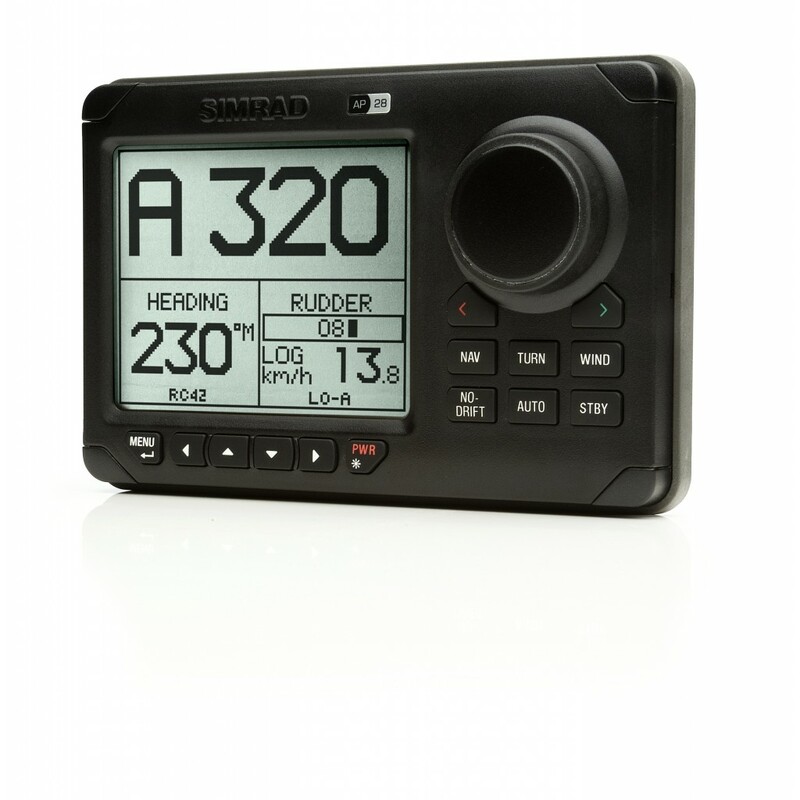 The AP28 autopilot includes a number of data pages where you can view autopilot parameters such as compass heading, set course, rudder position, as well as information received from other SimNet compatible equipment such as GPS navigation data and IS20 Marine Instruments wind, depth and speed data. Expanded multi-station compatibility offers several control options including use of Simrad AP24 Marine Autopilot control unit. Any future autopilot control units will also work thanks to the SimNet system. 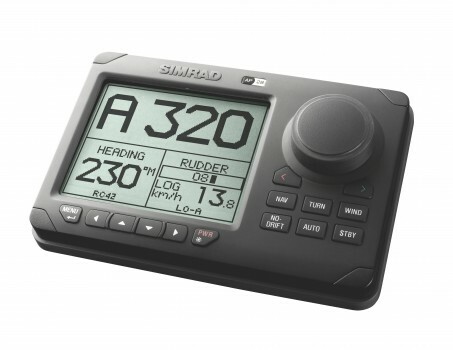 This unique feature, recently introduced to Simrad Marine Autopilots means that no rudder feedback unit is needed for outboards and stern drive boats. In terms of installation, you will save a huge amount of time and aggravation thanks to this sophisticated new feature. The AP28 includes a number of self calibrating features that automatically compensate for the unique handling characteristics of your boat and sea conditions, insuring optimum performance without the need for expert manual calibration. Simrad engineering ensures that you can always go to sea in the confidence that your Autopilot is pin-point accurate and highly reliable. 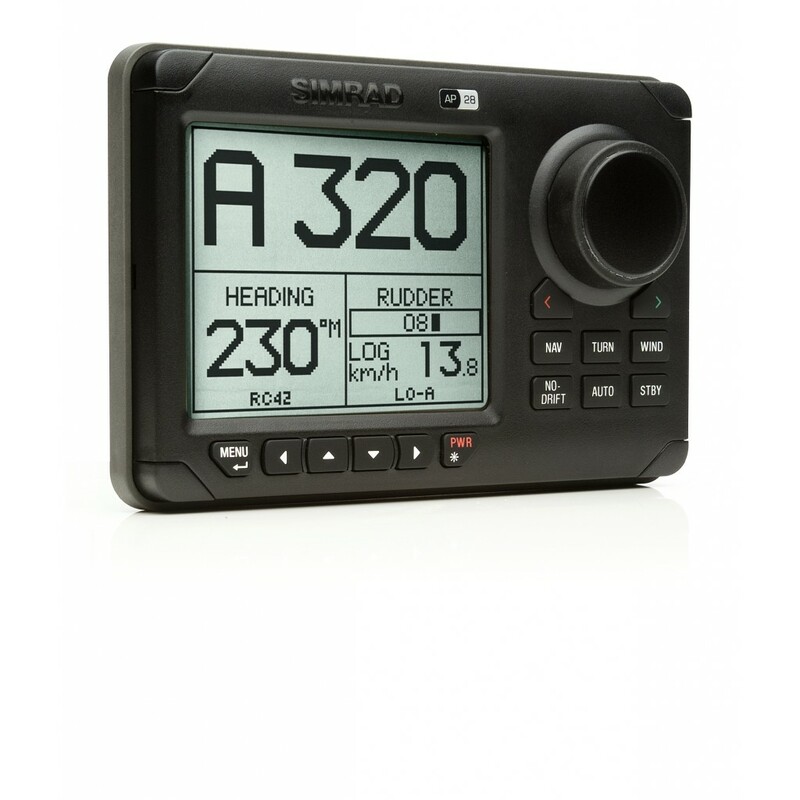 The Simrad AP28 boasts state of the art technology so you know you'll be safe, you know you'll hit your way points and you know that you'll arrive on time. But what about en-route? What can the Simrad AP28 Marine Autopilot do for you? This unique feature utilizes data from your fishfinder or depth instrument to maintain a set water depth, just as if you were manually steering your boat along depth contours on a paper chart. This leaves you free to concentrate on the big catch, enjoy the shoreline view or trim your sail. Two autopilot computers, the AC12 and AC42 provide more drive than the previous generations and include all of the control functions expected from a Simrad Yachting autopilot. Both models are compatible with Hydraulic and Mechanical steering systems. They also include the Simnet plug and play technology. The Simnet compass and rudder sensor are easier than ever to install; because you no longer have to run dedicated cables back to the autopilot computer. Instead the new SimNet sensors conveniently connect via the SimNet backbone. 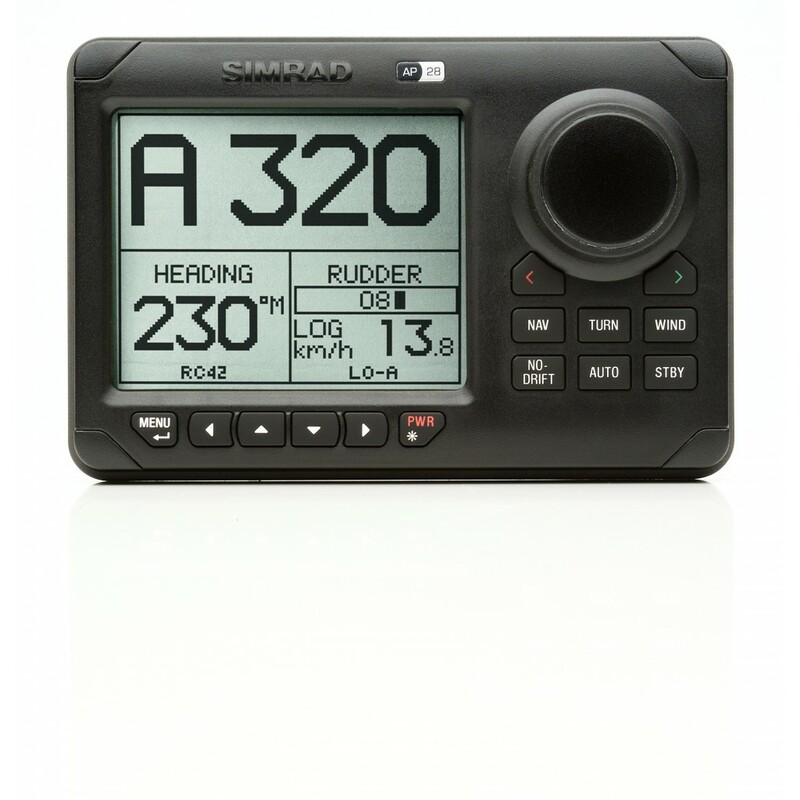 The advanced nature of the SimNet network insures the compass and rudder data is automatically routed back to the Simrad AP28 Marine Autopilot, plus any other SimNet compatible instruments, such as the IS20 Simrad Instruments and Rudder displays. 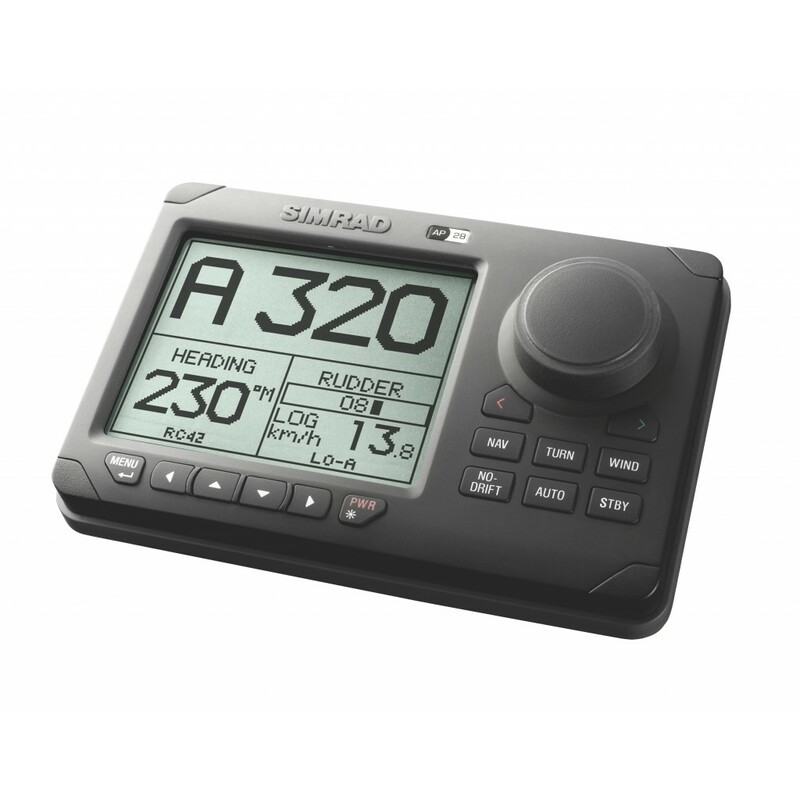 The Simrad AP28 Autopilot is backed by the Simrad Service and 5 Year Advantage Program.